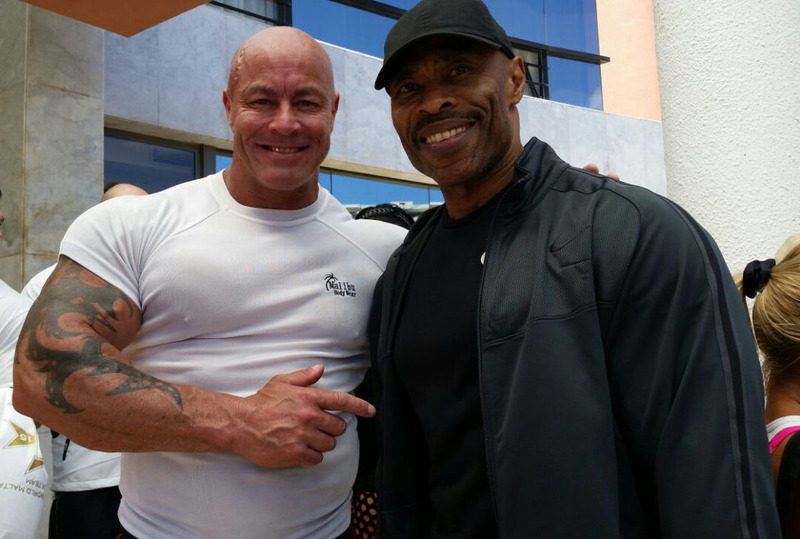 A few hours after completing a grueling workout on Thursday, Guyana’s world renowned bodybuilder, Hugh Ross picked up his bags, drove to the JFK International Airport and boarded a plane for Malta. The US-based behemoth flew to the European Union territory to compete at the 33rd NABBA World Bodybuilding Championships today at the Dolmen Resort Hotel and Conference Centre. Hugh Ross sharing a light moment with last year’s champion, Gary Lister shortly after arriving in Malta yesterday. The shredded 55-year old won the over-50 Masters category of the championship in 2012 and placed second last year to UK’s Gary Lister and is once again on a mission to hoist the Golden Arrowhead on the highest pinnacle. Ross was riding a wave of confidence when Stabroek Sport spoke with him yesterday. Ross revealed that Malta is ahead of Guyana by six hours and pre judging will be done this morning at 9:30 am (Malta time). The celebrated muscleman won the Mr. Universe Masters in 2010 and the World Championship in 2012. After placing second last year, 2015 could see the striated gladiator bringing home the bacon. NABBA is the first and the original competitive bodybuilding association. Formed in 1950, NABBA’s first Mr. Universe contest was won by Steve Reeves, who went on to make over 30 Hercules movies. Top bodybuilders who won the Mr. Universe title include Reg Park, Bill Pearl and Arnold Schwarzenegger (four-time winner).